Since that fortuitous move, Kirsten and her husband, Bob, have made an indelible mark on the fabric of our lives. Bob Whalen is, of course, Hizzoner, the leader of our fair city, Mayor of Laguna Beach. Kirsten, meanwhile, represents the artistic side of Laguna’s persona. While happy to support Bob who is obviously motivated by governance and community organization, Kirsten Whalen is rather the alternative, quietly expressive side of the Laguna pair. She is an artist, art activist, and art educator. Her new show of watercolors will open at the Festival of Arts this week. She’d be the first one to say, “What, you’re interested in me?” Yes, usually the press comes a-callin’ about Matters Of The City; addressing civic issues, serving charities, attending functions and the like. But, no, we wanted a heart to heart chat about the ways in which Laguna has shaped the person Kirsten Whalen, and vice versa. Kirsten studied art and design, earning a Bachelor of Science in Design from UC Davis. She worked as a graphic designer, designing books and business communications tools. When it was time to move from the Bay area for Bob’s law practice, the pair drew a circle on a map around his office location. That’s how they chose Laguna Beach. It was 1980, and affording Laguna was a long shot. “We thought it was economic insanity,” Kirsten said. But move they did. They started a life here, and both became involved in arts organizations and also in the organizations important to their kids: Erika, Andy, and Elliot. Bob became president of Laguna Beach Little League, the Boys and Girls Club and SchoolPower, and served on the School Board for ten years before moving on to City Council. Kirsten was also involved in the arts at the schools, and started the Performing Arts Booster Club at the high school. While their daughter was graduating college, and one son was graduating high school, Kirsten answered the siren call inside her head, and went back to school herself. Where else, but Laguna College of Art and Design? It was a homecoming for her love of education and also her desire to do “more personal” artwork. Back in college again, Kirsten experimented with technique and ways to merge traditional watercolor and oil painting to develop her own artistic style. In 2005 she received her Bachelor of Fine Arts from LCAD. There are entire bodies of study into the symbolism within art, especially those works not exactly realist. While Kirsten Whalen’s work is representational, it’s also something not. There is an ironic quality, and a sense of whimsy. “They are absolutely expressions of myself,” she says. “I call them my avatars,” she laughs. You can’t help but wonder, smile – and maybe start planning a trip. As inspiration, Kristen cites artist Wayne Thiebaud, known for his colorful depictions of commonplace objects like cakes, pastries and toys, and Laguna Beach artist Scott Moore, whose works highlight toys and miniatures with surrealist irony. This is Kirsten’s eighth year as a Festival of Arts exhibitor. Her piece, “Hanging Around” was selected for the Festival’s 2012 souvenir poster. Additionally, her work has won awards in the in the Western Federation of Watercolor Societies Annual exhibit (WFWS 37, Honorable Mention), and the annual City of Laguna Beach Juried Fine Art Exhibitions held by the Laguna Beach Arts Commission. She was a participating artist in the 2012 Laguna Beach Music Festival and with OC Can You Play in 2011. Kirsten is also a big proponent of arts education. In 2008 she started “Art Talks: A Lecture Series” at the Festival, and she’s still spearheading it. Besides being busy with the many arts organizations in Laguna Beach, Kirsten serves on the board of the Laguna Outreach for Community Arts (LOCA), the nonprofit committed to arts education for people of all ages. Kirsten’s family hails from Sacramento, and her dad built a cabin at Lake Tahoe in the 1950’s. Whenever Kirsten, Bob, and their kids get a bit of free time, they like to get up to the blue lake and enjoy a little kayaking. Maybe there will be time for that after the summer, but for now it’s full steam ahead for the Whalens as they navigate the busy summer season with arts and community matters filling the calendar. Say hello to Kirsten at her booth “on the main drag” of the Festival this summer. “I was a real stellar guy,” says Donnie Crevier. Now, if you didn’t know Donnie Crevier, you might think he was being immodest. After all, he is the recipient of countless philanthropic and business awards so if he wanted to describe himself as “stellar” few would argue. However, Crevier was being deeply sarcastic when he used that word to describe himself in his younger days as a teenager growing up in Laguna Beach. Donnie Crevier may be many things, but immodest is definitely not one of them. He came to Laguna from Glendale when he was five years old with his mother, “…a single, divorced woman with two kids and no skills.” Why Laguna? “She was a romantic,” Crevier explains. “I’m very appreciative for that.” Crevier attended grammar school and middle school in Laguna, but then came the teenage years. This was mid-way through his junior year at LBHS. By his senior year he was living on his own. “I needed an adult to be my guardian. I picked a guy I surfed with. He was about 22. I lived with him for awhile. I barely finished high school. In fact, I had to take a night class to graduate,” he explains. There is no drama in his recounting of these years, but clearly they were not the easiest of times. Crevier attended college for two and a half years. “I got tired of being broke and got a job in the car business,” he says. He had some experience. His father owned a used car lot in Glendale and Crevier worked there as a kid, washing cars and eventually doing some sales. He took a job selling cars at Theodore Robins Ford in Costa Mesa. He worked there for eight years. “Then my dad started a BMW dealership in 1972 with my uncle,” says Crevier. His dad had really wanted a Volkswagen dealership, but couldn’t afford it. Back then, BMW was not widely known in the US so it was cheaper to get BMWs than VWs. Crevier joined his father and uncle two years later, in 1974. The dealership grew and grew. “It grew beyond anything we had imagined,” says Crevier. “We had some father/son challenges along the way, but our relationship got tighter and tighter with time. We became mutually respectful of one another,” says Crevier. His father has since passed away, but it is obvious that father and son shared a deep bond. “My dad was a golden rule philosophy kind of guy. He believed in doing what was right, not just what was legal. And he believed in people. It is the people in that company…there’s a uniqueness in our people. We were lucky, but we consciously tried to find that. It ain’t all GPA or IQ. It’s how you relate to people. Do you care about people…?” The answer to that question, in regards to Crevier himself, is a resounding yes. Crevier sold the company he built with his father in 2011. However, he is still in the car business. HIs company, called Crevier Classic Cars, LLC, deals in classic cars as well as sales and leasing for all makes and models, new or used. The space is frequently used for events, and he encourages people to come check it out. He’s there every day. And while the car business still occupies much of his time, his philanthropy is also a time consuming endeavor. His list of honors is ridiculously long, and includes the Orange County Human Relations Award, the Good Scout Award (Orange County Council of the Boy Scouts of America) and the 2012 Citizen of the Year Award from the City of Santa Ana, to name just a few. And he certainly didn’t bring this list with him when we met, nor did he mention anything about awards or accolades. What he wanted to talk about was why the programs he supported were important to him. Two programs he is most dedicated to are The Boys and Girls Club of Laguna Beach and High School, Inc. The Boys and Girls Club of Laguna Beach holds a special place in Donnie Crevier’s heart. “It was a big part of my life. Back then it was just The Boys Club. From the ages of 10 to 14 it was really important to me. I’ve always felt a sense of responsibility to that organization. Things would have been a lot more complicated for me had it not been in my life,” explains Crevier. And to this day, he remains close to Pete Snetsinger, his coach at the Club. “He was a mentor to me. I’m having lunch with him next week, as a matter of fact.” Crevier was presented with the President’s Volunteer Service Award in 2009 for his work with the Club. He is currently still serving on the Board. Ambitious plans for High School, Inc. While Crevier will always be grateful for the Boys and Girls Club, he is deeply involved in a new endeavor that, while not as personal, definitely echoes the same theme: helping kids help themselves. High School, Inc. is a program that provides high school students with real work experience through six different academies: health care, culinary arts and hospitality, automotive logistics and transportation, new media, global business and engineering, manufacturing and construction. The program is currently at Valley High School in Santa Ana, but Crevier is looking to expand its reach. “We just had some wonderful news. Our graduation rate for kids enrolled in the six academies on campus is 98.5%. The grad rate for the rest of the kids is somewhere around 85%. We have 1,000 kids enrolled now. We need all the kids there to enroll. If High School Inc. is taking most of his time these days; Crevier still has time for more local giving beyond the Boys and Girls Club. He’s on the Board of the Laguna Beach Community Foundation and is heavily involved with the Laguna Beach High School Scholarship Foundation. Adding to his seemingly endless list of awards, Crevier was presented with the Donor Honoree at this year’s LBHS convocation ceremony. He started giving scholarships, now called the April and Daphne Crevier Memorial Scholarships in honor of his mother and sister. This year eight graduates were awarded these scholarships for doing “the right thing for the right reason.” Additionally, Crevier has his own family foundation that he started seven years ago. “My kids and grand kids are all a part of it,” he says with pride. Donnie Crevier uses words like “luck” to describe his success. He likes to give credit to others. And, if I think about it, he really didn’t talk much about himself (except to talk about his wayward youth), preferring to discuss the charities he cares about. He is a man who overcame adversity and became successful beyond his own imagination. He spends a lot of time and a lot of money helping others so that they, too, can overcome the obstacles life has placed in front of them. He would probably not like me to say so, but that, to me, is the epitome of a “stellar guy” (hold the sarcasm). She’s the quintessential Laguna summer girl… Growing up in the 1970’s, with her long blonde hair flowing, and stitching macramé necklaces woven with seashells she dove for that morning. She’d gather her paintings and nestle with them in a booth at the Sawdust in the day, and help run a concession at the Pageant of the Masters at night. Robin Wethe Altman has seen just about every permutation of Laguna life – from sleepy little beach town where she rode her bike to the high school and her horse along the bluff top, to the burgeoning international tourist destination and art mecca, replete with soaring real estate prices. These days Robin supports herself completely by her art. She is a long-time watercolor artist who has shown at all three Laguna summer art venues, and is watching this summer unfold from her booth at Art-A-Fair. When she was just a kid Robin got to join the very first Patriot’s Day Parade: her grandmother started it. Her grandma, Grace Wethe, was a member of the local chapter of the Daughters of the American Revolution. “She was maybe in her 80’s, but she wanted to bring patriotism back,” Robin tells us. Grandma was obviously onto something heartfelt and true, as the parade has been an important historical tradition in Laguna for 49 years now. “I got to ride in the parade in her honor three years ago,” Robin says with pride. Robin’s family held another long-time Laguna tradition, at the Pageant of the Masters. They ran the binocular concession, to the delight of an audience who wants to get right up close to the tableaux vivant, and maybe see the artwork move a little. It may seem surprising in light of current standard’s paychecks, but the rental of those binoculars was a way of life for everyone involved: Robin, her brother, mom and dad. It was “a bitter pill to swallow” when the Festival took over the concession, but Robin moved forward, and learned more to appreciate everything she has, in the moment. Since the binocular concession days, she has lived on her art completely. And she lived according to the mindset of an artist. Robin translated the beauty she saw with her mind’s eye to the canvas. Then she started selling her art at the Sawdust Festival – that place her parents wouldn’t even let her go to as a kid. The Sawdust was also a fortuitous place to be for Robin’s future as an artist. The Festival of Arts Foundation scholarship program provided her full scholarship to study art at college. She graduated in 1976 with a BA in Fine Art from Principia College. Robin Wethe Altman has now shown at ten different galleries in Laguna over the years, as well as The Festival of Arts, the Sawdust, and the Art-A-Fair festivals. She is in private and corporate collections, and even has her paintings on Hasbro’s puzzles. Her works are currently featured at Art-A-Fair and also at Laguna Watercolor Gallery, fulfilling her childhood dream of showing on “Gallery Row”. “It was like a gift,” she says humbly. Toward that end, Robin continues to spread her positive attitude, and she gives her art for good causes too, such as the My Hero Project to honor women, Transition Laguna’s poster, and cards for an interfaith group. The overriding theme of Robin’s artwork is idyll. That’s no doubt in part because she grew up in an idyllic place, and sees beauty everywhere. Ryen Caenn is such a fan of living in Laguna Beach he knows the month he and his wife moved here from Irvine – exactly 18 years ago this month. “When our kids went off to do their own thing we decided to come to Laguna. We’ve been here since then,” he says. They were anxious to jump into their new community, even if Caenn didn’t get to spend a lot of time here due to his work in the petroleum industry. “We joined Village Laguna when we got here. My wife was president. She was also the chairperson of the Charm House Tour. I was the support person,” he says with a grin. Caenn’s career has kept him on the road – a lot – especially as southern California isn’t exactly the heart of the oil industry. His travels have sent him all over the world, but his favorite place to be is home. His jobs within the oil industry have changed as the industry itself has changed, not surprising in such a boom or bust field. Starting as a drilling fluid technologist (or “mud engineer,” as it is more commonly referred to) in Houston, Caenn spent two weeks a month on drilling rigs. At the time, he had young children and the schedule wasn’t conducive to family life so he moved to a working in a lab. He then got a job in San Diego with a company that made a chemical used for fluid in the drilling rigs. From then on, southern California became home, despite the fact that it was not a hub of the oil business. Caenn settled in Irvine with his current wife who was a teacher there. “When you’re a teacher you can’t really change schools so we stayed in Irvine,” he explains. In 1981, Caenn says he decided to become a consultant. “It was bad timing,” he admits. It was the beginning of an oil bust cycle. In 1981 there were 4,000 oilrigs - by 1987 there were 600. There just wasn’t enough volume for him to continue his consulting business and make money. “It had a subscription of about 350 people,” says Caenn with a shrug. After that, Caenn started commuting – again – this time to Houston, two weeks out of the month. He did this for ten years. “That gets kind of old,” says Caenn in his understated way. In the early 2000’s Caenn met Stu Saffer. “In 2001 the petroleum industry collapsed again. I had some time on my hands. I met Stu at Heidelberg Café. We started spending time together. He was looking for some help to get a new local paper off the ground. I told Stu I’d like to help. I used the same software for my magazine that he wanted to use for his paper,” explains Caenn. That paper was “The Laguna Beach Independent” (or the “Indy). “The very first issue didn’t go well,” according to Caenn. “Stu wanted it to be around 14-16 pages. I ended up with ten. We had a hard deadline. I sent the file to the printer and they called and said there was no file. So I put the file on a CD and my wife drove it over to them. They still couldn’t read it. I remember it was raining, and I drove over there and ended up staying until around 1 a.m. I remember seeing my wife asleep on a desk. Finally, it got printed. Stu picked it up and took it out for delivery. The paper was so light it would blow back when they’d try and deliver it,” remembers Caenn. After a few months, Caenn’s job with the paper evolved. “I mostly worked on the Laguna Home Companion section. I did that for years. I had a camera so I took pictures; miscellaneous things like that,” he says. Then, in 2007, Caenn got a call that changed his career path, yet again. “I got a call asking me if I wanted to teach in Kazakhstan. My first question was ‘Where’s Kazakhstan?’” recalls Caen with a laugh. “I wasn’t sure, but my wife said, ‘Why don’t you do that?’ I went back five times and decided I really enjoyed teaching. Now, that’s what I do, primarily in Houston,” he says. Caenn teaches newbies about the petroleum industry. “Sometimes it’s marketing and sales people, sometimes it’s people who are just interested in the business. I do not teach people who are experienced in the business,” he says. “In the last four to five years I’ve been gone more than I’ve been home. I’ve been everywhere in the world there’s a petroleum industry.” Now, however, Caenn says his business is slowing down. And this time, he welcomes it. “I’m getting tired. My wife doesn’t want me traveling to places where people are getting shot,” he says appreciatively. But he’s still writing. He co-authored a textbook titled “Composition and Properties of Drilling Completion Fluids” that is used in universities. There is a definite theme to Caenn’s work, but apparently you have to be in the oil business to have any idea what it actually means! Finally, Caenn is spending more time at his beloved home in Laguna Beach. “I get up in the morning, have a cup of coffee on the deck and watch the birds. Right now we have a family of orioles. I sit there and watch the birds, and watch the ocean while I wake up,” says Caenn. After traveling for almost all of his adult life, when he talks of these simple pleasures it’s clear he savors them. But he does more than lounge around and stare at the horizon. There is his pond that needs cleaning; the 15-month-old puppy that needs walking; an exercise class at the Susi Q that needs attending – and he just took up lawn bowling. “I play for an hour and have a beer,” he says with a smile. But he’s not retired yet. “I still enjoy work and I have no plans of retiring,” he says. However, he’s is trying to make it so that he can do more of his work online to cut down on the travel. When you’ve been everywhere, there really is no place like home. Ryan Heimbach strikes me as a young person with an old soul. Unlike many young people, he knows what he doesn’t know, and seeks to learn the answers. He’s the first person I’ve talked with in a long time who actually calls himself an apprentice. The apprentice has enormous respect for his mentor, Festival artist and award-winning sculptor, Andrew Myers. “I didn’t think of art until I worked with Andrew,” Ryan says. Myers taught Ryan technique and logistics and the ins and outs of the art world, while Ryan developed his own artistic voice. Since 2008 Ryan has worked on many of Meyers’ big projects, finding inspiration along the way. “I did whatever he was a part of. He inspires me,” says Ryan. In “old soul” fashion, Ryan thoroughly appreciates his mentor’s finished works. “Even though my name’s not on it, I’m not that kind of guy,” he says. Apprentice he may be, but Ryan is accomplished enough to have found his artistic passion, with talent to match. He’s one of the youngest artists ever selected to show at the Festival of Arts, garnering accolades and art patrons along the way. His piece this year, titled Breaking Through, is a cast bronze, plaster, and stainless steel sculpture of hands emerging from the wall. A narrative piece in three parts, the first hand is clenched around an egg, moving on to the next hand with the egg cracking, while the third hand presents a fist emerging from within the egg it holds. It’s provocative sculpture, and draws queries and dialog with the patrons at the Festival. He grew up in Laguna Canyon, the son of a single mom, Diane DeBilzan, who had a gallery in Laguna for many years. His uncle is the artist William DeBilzan. Ryan was surrounded and nurtured by art before he realized he, too, was one of their kind. This year’s Festival piece, Breaking Through, represents just that emotion. The hand holds an egg that at first is solid like a stone, then it starts to crack, and then it’s polished and gleaming in its final incarnation, a new fist emerging as if to say, Yes, I can! “It’s like when you think you’ve broken through,” explains Ryan. “But you can still do more. Breaking through can be positive, like finding a cure for something, or mentally battling with something and then emotionally breaking through. There’s something mathematical to his sculptural precision: an understanding of proportions and dimensions. Ryan seems to have a left brain/right brain thing going on. Not surprisingly, while at Laguna Beach High School he won awards for accounting and pottery. “I wanted to do something I could relate to,” Ryan says about his Festival exhibit. He was remembering his own challenges. One was when he thought it would be a good idea to go live with his dad in Florida. He gave it a try – taking the only job he could find there: working the graveyard shift at Lowe’s. Working at night, sleeping in the day. “It was not my thing,” he says, simply. He pushed through and worked his way back to Laguna, knowing it was his true home and knowing he would have to work hard to stay. “I like being in ‘clutch moments’,” he said. “I can handle problem solving like that. I don’t want charity. Nothing is owed to me. I always want to feel I’ve earned something.” Old soul. Ryan’s first year at the Festival was 2011, and he was the youngest exhibitor. As one might imagine a young artist would do, he was still emerging his style and decided to change things up for the following year. He experimented with a different sculptural style, but it was not received well. Ryan was juried out. “The one year out made me think, and I pushed myself even harder,” he said. “I didn’t hide away or stop doing art. The experience showed me that this isn’t the end; it’s a stepping stone.” Breakthrough. The greatest sense of satisfaction is when an artist feels “on”. For Ryan, that joy and artistic focus is often born out of frustration or a struggle, but the process of creation pushes past any negativity. Ryan believes that artists should be proactive and keep pushing themselves. Now in his fourth year as a Festival exhibitor, Ryan is feeling good about the response Breaking Through has had. “I hope this show will inspire thought even more,” he says. Balance. It’s the word I kept thinking as I sat with Barbara McMurray eating lunch on her glorious deck. McMurray seems to have effortlessly achieved what many of us find so elusive: the ability to balance family, work, community and personal passions. Of course, just because it appears effortless, doesn’t mean it comes without effort. But whatever internal struggles she may engage in, to the outside observer, at least, she has them well tamed. McMurray came to Laguna Beach in 1991. Originally from New York where she grew up on a dairy farm, McMurray came to San Diego for a visit and was so “captivated” by the scenery she was living there six weeks later. She worked at an advertising agency for the ABC affiliate there in the promotions department. Then, at a New Year’s Eve party in Mira Mesa, she met her husband-to-be, Ken. “It was fated,” she says of their meeting. But he lived in Laguna Beach so there was a lot of back and forth on the 405 until McMurray decided to move north. They were married a year later. “He is my moral compass. I became a better person when I married Ken,” says McMurray. His calibration must be impeccable because McMurray’s willingness to give back to her community is almost legendary. McMurray pinpoints her daughter’s attendance at CLC (Community Learning Center) as what started her community involvement. CLC is an alternative school run through the Laguna Beach Unified School District at Top of the World Elementary for 1st-4th graders. “When Anna was in CLC the tide turned for me,” explains McMurray. “We were teaching the kids to be positive, to be involved so I figured I have to try and model these things myself. I taught yoga.” (Parents are expected to volunteer six hours per month at CLC.). “And it was so fulfilling to make that your goal - to be the things that they were teaching the kids to do. I love that program. They helped me be a better parent. So I got involved in the CLC PTA - my training wheels. It (volunteering) just kind of snowballed from there,” says McMurray. McMurray was asked to be on the Friendship Shelter Board “a couple of years ago,” she says. Her ultimate goal for the shelter? 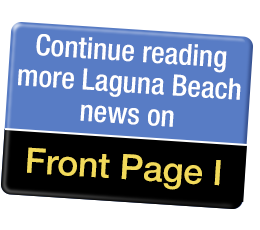 Nothing less than solving the problem of homelessness in Laguna Beach. She feels very optimistic. The other Board she sits on is Chhahari, which runs a home for orphans and at-risk children in Kathmandu, Nepal. It was founded by Laguna Beach resident, Christine Casey. “I have so much admiration for her. I do their Facebook page. The images, especially since the earthquake…pretty dramatic stuff,” says McMurray. In case you’re thinking of asking McMurray to join your favorite organization’s Board (And trust me, you want her), “Two Boards is my limit,” says McMurray. But that doesn’t mean she isn’t active in other organizations, as well. In fact, it seems that whatever charity you attend you’ll see, McMurray there lending a hand. While she is definitely a do-er, McMurray is particularly adept at is bringing people together. “I like to be a connector. I want to draw people in. That’s what being a community is all about. A lot of the time people want to help but don’t know how. Many of McMurray’s clients reflect her interests. The Laguna Food Pantry is a client. “We just had a happy hour taco bar at the Marine Room, which was our debut on the fundraising scene. [The event]…had a low threshold of entry. It’s good when you give people something easy to say yes to.” She is working to elevate the Food Pantry’s profile so they can better achieve their mission. “It’s a myth that it’s just for the homeless shelter. It’s for working people who need some help. It would be great if we could get it to be open on weekends,” she says. She calls herself a “Baby budding Buddhist.” “I grew up in the Lutheran church. This (Tibetan Buddhism) feels true to me…very true. You have to answer to yourself. It’s very forgiving, non-punitive in nature.” But graduating to a full-fledged Buddhist may have to wait until she has more time to dedicate to its study. “There is a lot to it, much to learn,” she says. The same can be said of McMurray herself. She would be the first to say she doesn’t have all the answers. Nevertheless, spending even a brief afternoon with her, hearing how she makes it all work, it’s easy to wonder how much more evolved she can hope to be. Maybe it’s the meditation; maybe it’s her husband. “I remember my mother telling me I had ‘too many irons in the fire’ when I was younger. I guess I just have a lot of interests,” she says with a shrug. Somehow she has managed to master those many irons, forging them into a very complete, well-balanced life. The Return of September – McGee that is! The long time Sawdust artist is happy to be back in the ‘Dust. “Artists are such nice people. They’ve been so wonderful,” September says. “It’s healing for me to be here.” Sage words considering her trip to the east coast was for medical care. The art venue is like a friendly, welcoming embrace upon returning home in good health. Add to the warm and fuzzy feeling a few new art awards, and September has the makings of a very good summer. The award-winning artist does not quietly paint away in her studio. She projects her soul into her artwork and the expression gives her voice. She delights in sharing with others, as is evident anytime you happen by her booth where she is usually engaged in animated conversation with her many visitors. She is an artist changing the world in her own way, by educating and giving back through her medium. After 9/11 September was stirred into action and asked herself: “What can you do to promote tolerance?” The answer began with a painting of five children (all from Top of the World School), of different ethnicities holding hands in front of the flag. The painting went to a charity event for Patch Adams, a humanitarian luncheon attended by the Vice President’s wife, Lynn Cheney, and then on to fundraisers for Child Help USA, Children Uniting Nations, and the Hunger Project. September was happy to meet people through this journey, and see her painting as a catalyst. Expressing herself through artwork has been something September McGee was good at since about her first art award in the third grade. That one was for a drawing in crayons of a symphony conductor. “I was a realist – staying inside the lines,” said September. “Then I moved on with what-else-can-you-do!” Onto impressionism, training in figurative work and portraiture. The awards have continued since that third grade win, including numerous juried competitions and elected membership in excusive international artists groups. She was recently notified that one of her paintings has been accepted into the Allied Artists of America Juried Exhibition at the Salmagundi Club, New York – that’s a big deal. But there’s more… It’s a painting of a symphony conductor! Just like her third grade self, September is excited, humbled, and amused by the irony that two paintings with the same subject should be honored. “It’s a big coup and the interesting news is it is a painting of Carl St. Clair who is celebrating his 25th Anniversary with the Pacific Symphony and as you know he lives in Laguna Beach,” said September. September has shown at the Sawdust since 1993. For two years she participated in the Festival of Arts as well. That was hard, going back and forth between festivals, she admits. “I didn’t know who I was!” But she has been an artist her whole life despite the challenges. Sometimes it’s the difficult obstacles that open new horizons. “It’s not easy. It has its tortuous moments – you want to create but don’t always know the way. Such words of wisdom float around in her brain and are just calling out to be heard. So, she wrote a book. And then another one. September has put her passion and inspiration into two books. The first evolved from her children’s art classes around town. Written and illustrated by September, the book focuses on a child’s wonder at the beach. Let’s Sail Away is an educational and fun story about preserving our tidepools. September’s passion and inspiration are a joy both in print and on canvas. If you have lived in Laguna Beach for any length of time it is very likely you’ve heard the name Morris Skenderian. Skenderian, one of Laguna’s most well-known and respected architects first came to Laguna Beach in 1968 when he was a 26 year-old architectural neophyte. The renowned architect, William F. Cody, saw something in the young Skenderian and brought him along to work on St. Theresa’s Catholic Church in Palm Springs. This is how Skenderian was introduced to what eventually would become his hometown. And he did, finding a 300 square foot cottage where he worked on mostly kitchen and bath remodels. They say talent always rises to the top. This is undoubtedly true in Skenderian’s case. However, he credits his big break to a very surprising source: The American Youth Soccer Organization (AYSO). And this highlights another important contributor to his success: Skenderian’s ability to forge and maintain great relationships with his clients. “One of the things that attracts me to this business is I love the relationships. 90% of my friends are former clients,” he says with satisfaction. After 40 years of working in the same town, suffice it to say, he’s never short on dinner invitations. While some architects have a very consistent aesthetic, Skenderian says he likes to look at design as more “solution-oriented.” That may be why, after the devastating fire in 1993, Skenderian’s firm designed 25 of the 75 houses built to replace ones that had burned. While he says he likes doing both commercial and residential work, talking about his involvement with the Athens Group when they were designing and building Montage Laguna Beach back in 1995 brings a heightened level of enthusiasm to the conversation. However, the thing that seems to give him even more pleasure than bringing spaces to life is spending time with his six grandkids, who live in either Laguna Beach or Newport Beach. “They’re here (at his office) all the time,” says Skenderian. He proudly describes the projects two of his grandsons worked on recently. “When you’re this close you get to be a mentor to your grandkids,” he says. Whether the mentoring fosters more architects in the family seems to be beside the point. He just enjoys spending time with them, teaching them different skills, exposing them to new interests. The pieces were falling into place for Skenderian’s future as an architect, but he still wasn’t sure that’s what he wanted. “I didn’t really know what architects did,” he says. But then he met a friend who told him he should go to Cal Poly San Luis Obispo, “He told me, ‘You’ll love it! It’s farm country, a small town’…so I took my portfolio, talked to the Dean and got myself invited. I started in 1958 and graduated in 1962, which was unheard of. My dad said, ‘You have four years’ so I went through kind of scared,” he says wryly. After graduating from Cal Poly, Skenderian secured a job working for an architect. And, minus the year he spent in Memphis with the Navy (he got drafted), and the few years he spent learning how to build things with the Huntington Harbor Company, Skenderian has been an architect ever since. And while he may not have planned it, he seems very content with the way things turned out – kind of like living in Laguna. “What brought me here was the sheer physical beauty, the village character and the people. Back then the freeways weren’t all connected. My clients were not of wealth. I liked what I saw as I became part of the fabric of the town. I wanted to improve it, and also prevent people from ruining it,” he says. And while there are a lot more freeways and a lot more people of wealth than when he arrived, he’s still committed to improving Laguna, one project at a time. I caught up with our local rock star at his “office”, aka the patio beside Sapphire. Nick Hernandez makes regular stops there to fuel up on coffee, and just about everyone stops by to chat him up. Having spent many years on the road touring with his band, Common Sense, it feels good having a home base. Really, he’s happy making music anywhere. “I love waking up in a new place every day, touring on the road. And I love it here at home,” says Nick. “If you’re me, it’s awesome!” No doubt. Common Sense is the first of Nick’s bands to go really big. It’s still going strong, but in its most prolific years the band sold more than 50,000 albums, with “Psychedelic Surf Groove”, and 10,000 with “State of the Nation, Now and Then”. A couple of his songs have made it to Hollywood. “Never Give Up” is a big song that made it into the movie, Speed Two, and “In Your Eyes” was in the Kingpin movie, which Nick says has got a cult following. Recently Nick recorded music with Wyland as a benefit following the Gulf oil spill disaster, a trio of albums called Blues Planet I-III. And this past winter he played with noted Hawaiian musician, Willie K in his Maui music festival along with the likes of Steven Tyler, Mick Fleetwood, and Taj Mahal. There’s always a crowd on Fridays at Mozambique catching Nick live with his band, Nick-I & A.D.D., and other live gigs at places such as the Coach House, the Belly Up, and the OC Fair as well as special events and corporate gigs. Sound like a lot of balls to juggle in the air? Toss in Nick’s co-passion for surfing, and add to that his participation in Surfers Healing and you’ve got one busy dude. Surfers Healing is an outreach program designed to foster joy and promote surf culture in the lives of autistic youth. Nick has served on the board of directors for 17 years. The idea is to get the kids out on the waves with the assistance of able surfers. “We want to give them one nice beautiful day at the beach, and just feel normal,” says Nick. Nick can relate. “I understand him, ‘cause I’m a little out-there too,” he said. “Things bug me, like loud noises.” Playing music with a loud band is not bothersome, however, it’s more the sound of people “yammering” and dogs barking. “I’ve just always been kind of special,” he admits. Nick grew up in Laguna Beach, and learned to love music at the footsteps of his dad, Nick Sr. His dad was in a blues band, and put his son in classes for classical guitar and violin. And just as surf fashion brands began by sponsoring competitive surfers, Nick brought them along to music. For example, there was a two-page spread in Rolling Stone for his music that O’Neill surfwear brand paid for. There is a natural tie-in between the fashion, philosophy, and music of the surf culture. There is still something Nick needs to check off his list. “It’s the eight unit monkey sitting on my back!” he says. Getting the eight units accomplished and giving his vocal chords a couple months of much-needed rest are in the near future. And the 25-foot wave he caught in Mexico last year is calling him. After 20-plus years of rocking out multiple nights every week, maybe he deserves a little vacation. But then get back here and light up the stage! Sande St. John loves Laguna. “I love, love, love living in Laguna,” she says with her trademark enthusiasm that belies her 30 year residency here. “I love how you can agree or disagree with people and still be friends. I love how everybody works together for a good cause…” and her list went on. St. John knows a lot about good causes as she seems to specialize in them. Not just a few pet projects (though she has those), but many, many causes. So many causes, in fact, that to list them would make for an article much too long to print. Suffice it to say, St. John has developed a well-deserved reputation as someone who can get things done, hence the nicknames like the “Uber-volunteer”, ’the ultimate do-er” and “Laguna’s Super Angel”. This determination to make things happen, coupled with an apparent aversion to the word “no,” has earned her a myriad of civic awards from being the first recipient of the Laguna Beach Outstanding Woman of the Year in 1996 to the Laguna Beach Seniors Legacy Award in 2013, with many others in between. Children, seniors, veterans, the homeless and the arts have all received St. John’s attention – over and over again. Right now, she’s focusing her legendary energy on two events: the Firefighters’ Pancake Breakfast at Heisler Park on Labor Day and a celebration of Jon Coutchie, the Laguna Beach motorcycle officer who was killed in a traffic accident while on duty two years ago. It’s easy to think things like the Pancake Breakfast run themselves because they have been around for so long and are such a community tradition. I’m sure St. John wishes that was true. However, someone needs get it all planned and nailed down and that someone is St. John. And still, after all these years, she’s enthusiastic. “I just love that the Fire Chief (Jeff LaTendresse) comes year after year and sits there stirring the batter. He stirs the batter the whole time! The Fire Chief! He has been doing it forever,” says St. John. If the Pancake Breakfast is a tradition that needs overseeing, the celebration of Officer Jon Coutchie is a brand new endeavor. “Jon’s mom, Luciana, wanted to do something for her son. He loved kids so much. He loved Halloween. So we decided to make it a Halloween-themed celebration of John and make it a family affair,” says St. John. St. John got involved because, as she says, “I like Luciana. I love her. I feel her spirit.” So she got to work. “We have really good sponsors. It will be at Tivoli Too. We will have a lot of games for kids, a lot of community organizers, the Girl Scouts, the Boy Scouts, the police and fire will be there. Blue Water Music is doing the music. We have food from all these different restaurants: Tivoli will be offering a complete dinner, and Mare, k’ya, Mozambique and Sapphire will be offering small plates. We’re working on a haunted house because John used to build one for his god children every year,” explains St. John. She tells me this and then adds, “We’re going to have a silent auction and the funds raised will go to the CSP Laguna Beach Shelter.” That’s how St. John puts on an event. At least it is for her. St. John’s initial volunteering may have been instigated by her son, but it was fostered by her friend, Sandy Thornton. The two women served as co-Directors of the Laguna Beach Chamber of Commerce for years, legendarily putting together a wedding at the Hotel Laguna for two victims of the Oklahoma City bombing, among other things. The two were, and still are, known as “The Sandies,” even though Sandy Thornton moved to Palm Springs. “People still can’t tell us apart. Now, when Sandy comes by they’ll start talking to her, ‘Thank you for this or that’ and she just says ‘You’re so welcome’ even though she has no idea what they’re talking about!” says St. John laughing. It was the “other Sandy” that got St. John involved with the seniors when they were still using Legion Hall as their home base. That’s where St. John and I met, as she graciously squeezed me in despite an incredibly hectic schedule made more so by the fact that her daughter-in-law just had a baby and the family, who was moving, needed to be out of their house in days. The fact that she agreed to meet and be interviewed despite her very impacted schedule speaks both to her generous nature and to that problem she has of saying “no.” “I love working with the seniors. They are so happy to be out. They’re so nice and grateful,” she says fondly. “I love this building,” says St. John of the Legion Hall. It was in a rather chaotic state when we met, but she seemed unfazed. It was just another project to tackle. Now, the building is home to No Square Theater, of which St. John is a founding member (of course!). “My goal in life is to keep the theater alive,” she says with passion. But she won’t be aiding that cause by performing on stage. If only the Easter Bunny could speak! One of the other things St. John loves (and she loves a lot of things!) is her direct connection to both the Easter Bunny and Santa Claus. “I own the real ones!’ she states emphatically. Then she tells me a hilarious story about when she had to dress up as the Easter Bunny and, because the Easter Bunny “can’t talk”, she took to “beating” a volunteer who was not going to give a kid an Easter basket because their name wasn’t on the list. “Since I couldn’t talk I just started beating on them to please give this kid an Easter basket. I’m sure it was much worse watching the Easter Bunny whacking this volunteer…I should definitely not be the Easter Bunny,” she says shaking her head. She may not feel well suited as the Easter Bunny, but she certainly makes a great stand in for the Energizer Bunny. But even that long-lasting, hard-charging critter has to slow down at some point. “I would love to get younger people in these organizations. Every single group needs people. They need people with passion and vision. It’s hard to get them. So much has been done and there are so many groups out there. “Way back when there was just the Laguna Beach Service Council. Once a month we got together and sat around and just talked about the things the city needed. So many of them have been done or there are really great organizations working on them,” she says with a mixture of pride at how much has been done and a little melancholy for simpler times. But if that sounds at all like a complaint, it isn’t. “I love and feel so blessed just to live in this incredible place. It’s paradise. If you live in Laguna you’re lucky enough,” says St. John emphatically. Because of people like Sande St. John, I couldn’t agree more.